Mom's Gone Bronson! : Burt's Bees has done it again! As a member of BZZAgent I recently received a free full size bottle of Burt's Bees Sensitive face wash and full size moisturizer! Thrilled at the chance to try them I have now been using them both for a little over a week and I have to say that I am honestly amazed at how wonderful they both work on my skin! I don't have terrible skin by a long chalk, but it does start to get a little dry this time of year - especially after a long, dry, summer. I am not all that great at getting into a routine with cleansers or any of that kind of thing and I rarely wear too much make up either. However, after using the wash and the moisturizer twice a day in place of regular facial wash etc, I have noticed a difference. My skin is softer and more radiant and there are no harsh side affects or issues. 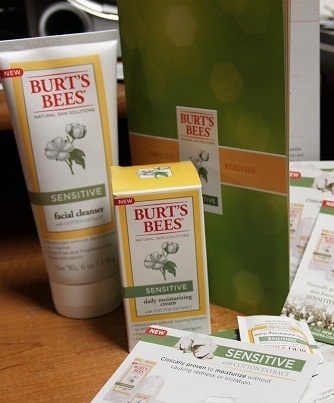 I am confident that Burts Bees has done it again with a good, natural, product and I hope to carry on using this for a long while after my trial runs out!